Van Geffen Vibration Monitoring Services is an independent service company specialized in preventing and solving problems with machinery, foundations and constructions. Ever since 1987 we resolve malfunctions where others failed. As a truly independent company we do not benefit from overhauls or from the sales of spare parts or machinery. 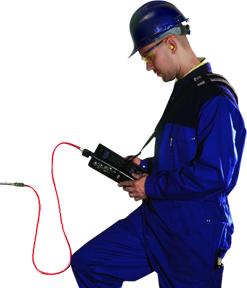 As one of the most specialized and experienced companies in the Netherlands, Van Geffen Vibration Monitoring Services stands for excellent service and quality. Offering a quick solution when it is needed the most. For this, Van Geffen VMS has a reputation that is known internationally. We perform field-balancing in Taiwan, vibration surveys on a steam turbine in France and travel to the oil fields of Abu Dhabi to balance a large generator. We commission new machinery in Switzerland and Italy and provide an important contribution to the offshore world wide! Vibration measurements and alignment of a diesel-generator on a gas rig in the North Sea and vibration surveys at the largest crane vessel of the world are just some examples of our diversity. As ships are moving continuously, Van Geffen VMS is travelling after these ships and is world wide involved with the condition monitoring programs of dozens of ships. In the mean time in the Netherlands, tens of companies in ao. the metal-, paper, chemical and food industry count on us for their condition monitoring. We monitor the machinery of Holland's biggest soup producer and are always stand-by as trouble shooters for one of the largest electricity providers in the Netherlands. We measure, analyse and we consult. World wide, at any given time and in every industry segment. Van Geffen AMS is a truly service providing company, one hundred percent no-nonsense. We do what we do best and are passionate about it. 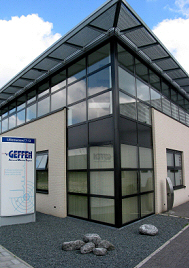 Van Geffen AMS is proud of its specialized people working with knowledge, experience and state of the art equipment. Rotating equipment needs and has our attention. This is why you benefit from us as your direct line between you and your failing machine. We are SCC (VCA) certified and work according ISO standards. Our specialist are NOGEPA, OLF and OPITO certified and posses all necessary papers to directly travel to, and to safely work on board ships, construction barges and oil and gas rigs. Ever had the costly experience of failing machinery at the most inconvenient time possible? No one able or willing to solve your problem, because of holidays, weekend or Christmas? Do you know an organisation that is on your wavelength and that will do anything to write the words "care free" in your schedule? You will never call on us for nothing. Problems always occur at an inconvenient time. This demands flexibility from the specialists helping you to solve your problems. Van Geffen AMS guarantees you this flexibility: 24 hours a day, 7 days a week, 365 days a year. We always have time to prevent downtime.